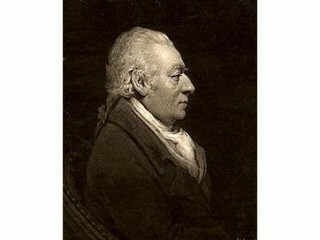 James Wyatt was an English architect, a rival of Robert Adam in the neoclassical style, who far outdid Adam in his work in the neo-Gothic style. Wyatt spent six years in Italy, 1762–1768, in company with Richard Bagot of Staffordshire, who was Secretary to the Earl of Northampton's embassy to the Venetian Republic. In Venice, Wyatt studied with Antonio Visentini (1688–1782) as an architectural draughtsman and painter. In Rome he made measured drawings of the dome of St. Peter's Basilica, "being under the necessity of lying on his back on a ladder slung horizontally, without cradle or side-rail, over a frightful void of 300 feet". Externally it was unremarkable (illustration, right), but the classicising domed hall surrounded by galleried aisles and apsidal ends, was something new in assembly rooms, and brought its architect immediate celebrity. The design was exhibited at the Royal Academy, private commissions followed, and at the age of 26 Wyatt found himself a fashionable domestic architect and an Associate of the Royal Academy. His polished manners secured him friends as well as patrons among the great, and when it was rumoured that he was about to leave the country to become architect to Catherine II of Russia, a group of English noblemen is said to have offered him a retaining fee of £1,200 to remain in their service. His major neoclassical country houses include Heaton Hall near Manchester (1772), Heveningham Hall in Suffolk (circa 1788-99), and Castle Coole in Ireland, as well as Packington Hall in Staffordshire, the home of the Levett family for generations, and Dodington Park in Gloucestershire for the Codrington family. In 1776, Wyatt succeeded Henry Keene as Surveyor to Westminster Abbey (in which year he was appointed Elizabeth, Countess of Home's architect on Home House, though he was sacked and replaced by Robert Adam a year later). In 1782 or 1783 he became, in addition, Surveyor of the Ordnance. The death of Sir William Chambers brought him the post of Surveyor General and Comptroller of the Works in 1796.